ClimaLoop measures the impact that different activities or products have on the environment, particularly on climate change. The measurement relates to the amount of greenhouse gases produced in a product chain or in the day-to-day lives through burning fossil fuels for electricity, heating and transportation etc. The Carbon Footprint services of ClimaLoop involve the calculation of greenhouse gas (GHG) emissions associated with the lifecycle of a product, service or with the entire business. The Carbon Footprint could be a tool for managing GHG emissions along the business organization or product supply chain and safeguards the survival of companies in the changing regulatory and economic business landscape. ClimaLoop helps the reporting organizations to disclose their most critical impacts on the environment applying the Global Reporting Initiative standards. The Global Reporting Initiative (known as GRI) is an international standard used by businesses, governments and other organizations to understand and communicate their impacts on issues such as climate change, amongst others. – The primary footprint (Scope 1) is a measure of the direct emissions of CO2 from the burning of fossil fuels including domestic energy consumption and transportation (e.g. car and plane). The client would have direct control of these. – The secondary footprint (Scope 2) is a measure of the indirect CO2 emissions from the whole lifecycle of products used – those associated with their manufacture and eventual breakdown. As an indirect consequence of our activities, the more we buy the more emissions will be caused on our behalf. – The tertiary footprint (Scope 3) is a measure of the indirect CO2 emissions (not included in Scope 2) that occur in the value chain of the reporting company, including both upstream and downstream emissions. ClimaLoop helps organizations to understand their carbon and environmental footprint, and how reducing it can create a better business. A growing number of businesses are taking steps to manage their GHG emissions and reduce their climate impact. These businesses are enhancing their brands, motivating employees, becoming more efficient and saving money. Business can be making real and measurable positive change by measuring, reducing and/or offsetting its carbon footprint. ClimaLoop measures the absolute climate impact of a product and its use. It provides a basis for companies to develop sound GHG reduction strategies and manage product/ process development and implementation in an explicable manner – both internally as well as with supply chain partners and customers. The Carbon Footprint of a product describes the sum of greenhouse gas emissions accumulated during the full life cycle of a product in a specified application. ClimaLoop measures the climate impact of an event considering the GHG emissions of the venue (power consumption, heat energy, refrigeration), the travel of the participants to the event, accommodation for the participants, and waste. 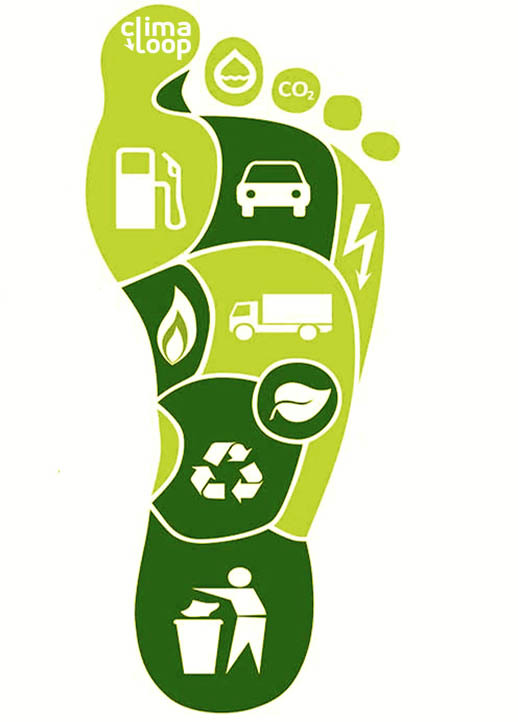 The Carbon Footprint of an event describes the sum of greenhouse gas emissions generated in the whole event and can become a Carbon Neutral Event using the CERs generated in ClimaLoop´s portfolio.